Bill of Lading | Rosenau Transport Ltd. Bill of Lading | Rosenau Transport Ltd.
A bill of lading is a detailed list of freight which is given to our driver along with your shipment. It clearly lists the origin of the shipment, its destination, where it is being delivered, and who is paying for the shipment. It also lists the characteristics of your shipment, such as weight, dimensions, and any special handling instructions. Accurate bills of lading make for a smooth delivery. The clearer it is, the less likely it is that there will be any miscommunication about your shipment, either in transit or when it is being billed. Incomplete bills of lading can lead to accounting mistakes. Delivery can even be delayed if the freight isn’t listed properly and the driver is stopped at a weigh station or by a Ministry of Transportation enforcement officer. Who is paying for the shipment. Complete origin address, with phone and name of contact. Complete destination address, with phone and name of contact. Accurate weight and dimensions of each skid or box. Any special handling instructions, such as if the shipment contains hazardous materials. Bills of Lading are a legally mandated document which must be given to the Rosenau Transport driver when the freight is picked up for delivery. If the bill of lading is not filled out completely and accurately there is a risk of your shipment being delayed at pickup or at weighing stations along as it is being transported. 1. DATE: Include the current date. 2. AFFIX PRO LABEL HERE: Put the pro label on the indicated area. 3. SHIPPER'S NUMBER: Include the reference number provided by Rosenau Transport. 4. 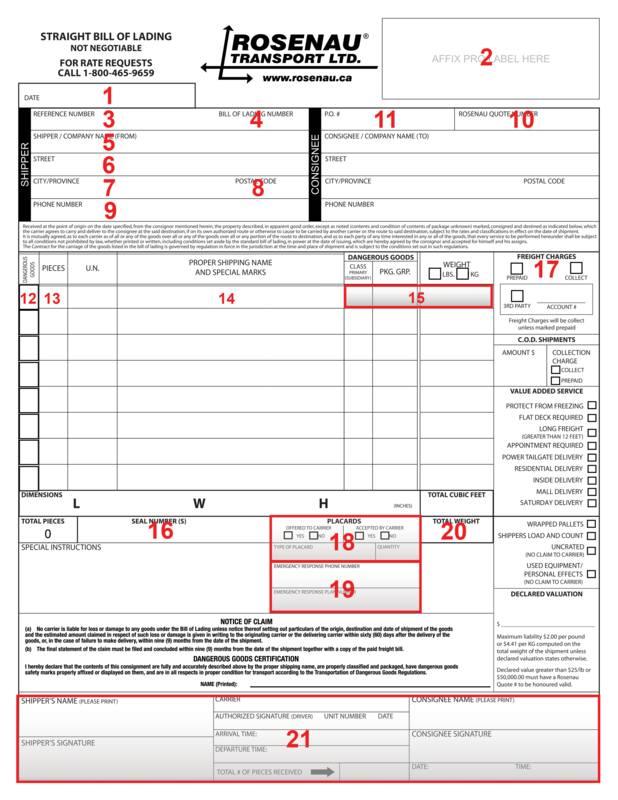 BILL OF LADING NUMBER: Include the Bill of Lading number provided by Rosenau Transport. 5. COMPANY NAMES: Include the company name of the sender and recipient. 6. STREET: Include the street address of the shipper and recipient. 7. CITY/PROVINCE: Include the city and province of the shipper and recipient. 8. POSTAL CODE: Include the postal code of the shipper and recipient. 9. PHONE NUMBER: Include the phone number of the shipper and recipient. 10. ROSENAU QUOTE NUMBER: Include the quote number for the shipment. 11. P.O. NUMBER: Include the P.O. number for the shipment. 12. DANGEROUS GOODS: Identify any items which are considered dangerous goods. 13. PIECES: Include number of pieces to be shipped. 14. PROPER SHIPPING NAME AND SPECIAL MARKS: Describe the goods being shipped in detail along if it is in crates or containers. 15. DANGEROUS GOODS: Include the class of goods, pkg. group, and weight of the dangerous goods. 16. SEAL NUMBERS: Record the security seal numbers on the packages being shipped. 17. FREIGHT CHARGES: Identify if the shipment is prepaid or paid on delivery (COD). 18. PLACARDS: If the driver will need any placards for the goods being shipped, indicate the type and how many will be needed. 19. EMERGENCY CONTACT: Identify an emergency contact and their phone number if dangerous goods are being shipped. 20. TOTAL WEIGHT: Add up the total weight of the shipment and record it accurately. 21. NOTICE OF CLAIM: Ensure shipper, driver, and recipient sign and date the bill of lading.